Hypothermia is the lowering of core body temperature to 35°C (95°F) or below. This is an important medical emergency for first aiders and first responders to recognise. Maintaining a normal body temperature depends on the ability to lose heat to the environment at the same rate as it is produced by the body. In normal individuals, body temperature regulation is usually very effective. 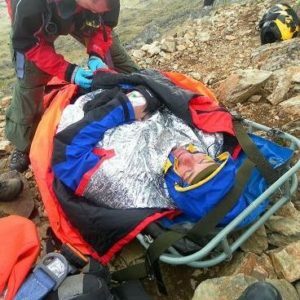 Exhaustion reduces the effectiveness and when exposed to extremes of cold for a period of time, especially under huge physical effort, hypothermia is often encountered. Evaporation is the conversion of a liquid to a vapour. Under normal resting conditions, about 22 per cent of heat loss occurs through the evaporation of about 700 ml of water per day, 300 ml in exhaled air and 400 ml from the skin surface. Because the elderly have reduced metabolic protection against a cold environment coupled with a reduced perception of cold, they are at greater risk for developing hypothermia. Young babies, because of an undeveloped thermoregulatory centre, and people involved in outdoor activities are also at high risk of hypothermia.